I’ve been wanting to try the sang har mee at Sang Kee for quite some time especially after my in-laws told me how tasty the noodles were when they ate there a couple of years ago. But when you’re dressed in office wear, the thought of eating in an alley on a hot afternoon isn’t practical…especially if you have a meeting after lunch. Luck was on my side last week as I had a relatively free afternoon (plus it was smart casual Friday) so I checked the place out with two new makan kaki. The eatery is located near Petaling Street – off Lorong Yap Ah Loy to be exact and can be difficult to find if you’re not familiar with the area. Good thing one of my makan kaki knows the place well so I followed him like a blind mouse. 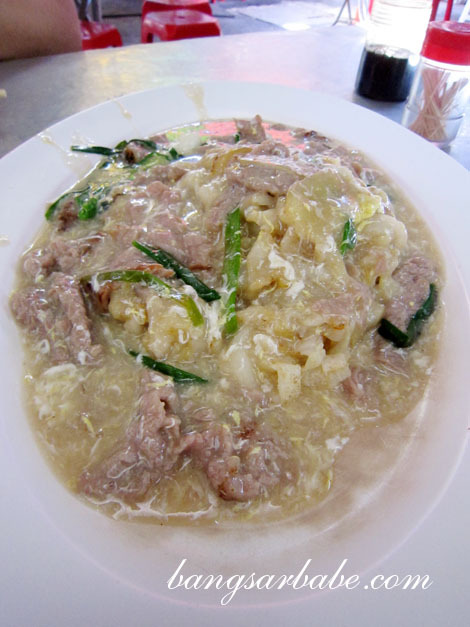 Sang Kee is an old-school restaurant that has been around for more than half a century. 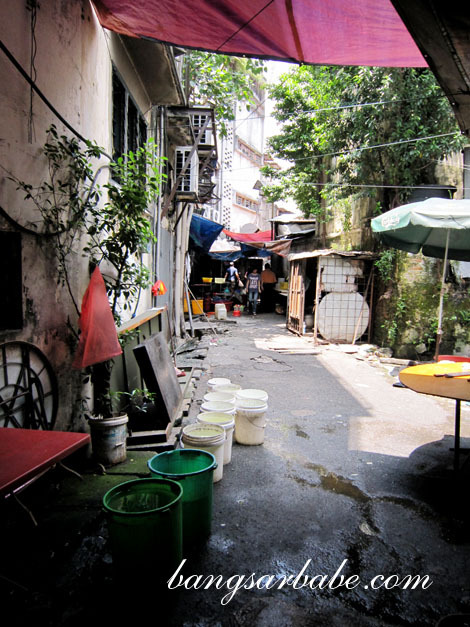 To get there, we walked through a back (and wet) alley which can be off-putting to some. At half past noon, the place was crowded. Plates of noodles were lined up at the cooking station waiting for the chef to add the gravy and meat on top. 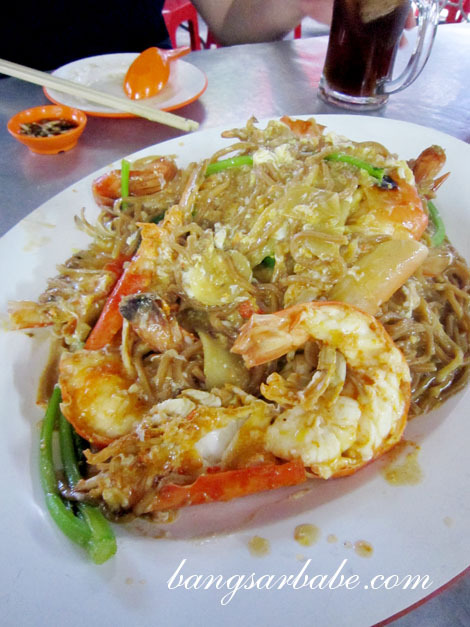 We ordered a plate of ginger beef kuay teow (RM18) and sang har mee (RM29 per prawn) for 3 pax. Service wasn’t the most pleasant; it’s best to know what you want to order as any delays while ordering might cause the auntie to nag. The beef kuay teow was pretty decent, at first. I say at first because there wasn’t enough gravy and halfway eating, the noodles dried up. That said, the kuay teow had a fluffy texture and a touch of wok hei. The beef slices were smooth and tender but scant for a portion of three. Unlike most beef noodles I’m accustomed to, this one was lighter in colour, with less ginger and less beefy. An old-school method, I reckon. I’m not sure if I had set my expectations too high on the sang har mee because when I finally tried it, I was disappointed. For RM29 per prawn and in such ambiance, I thought it was way overpriced. To make matters worse, the prawns were mushy and powdery. 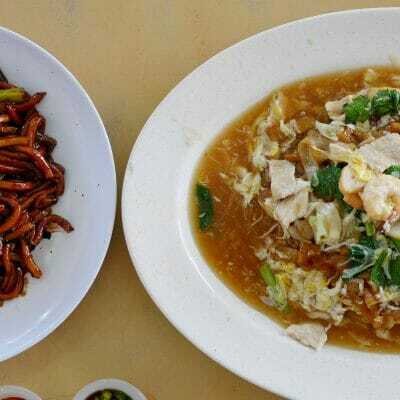 It was devoid of any seafood sweetness – something very important in sang har mee. To be fair, the thick yee mee had a good bite and the egg gravy was richly flavoured (from some MSG and prawn stock). The bill came up to RM113 inclusive of herbal tea for the three of us. Very expensive, if you ask me. The RM29 I paid per prawn can full well buy me a satisfying antipasti lunch buffet or a better plate of sang har noodles at Pan Heong. Oh well, at least I can say I’ve tried it. Verdict: Overrated sang har mee but the beef kuay teow is worth trying. RM29 per prawn does seem a little steep. So far I still like Pan Heong best for sang har mee, how abt u? 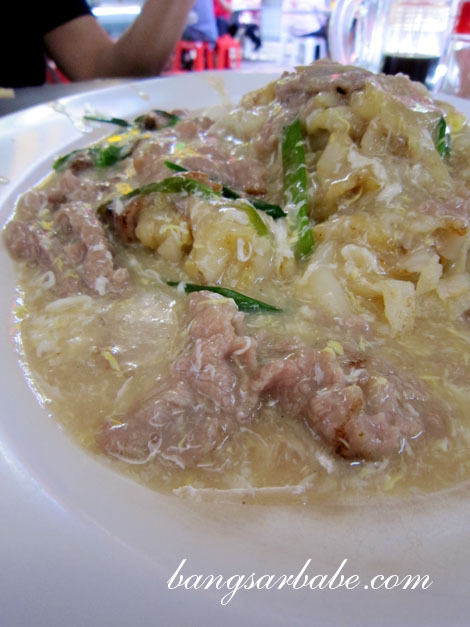 that is my dad’s fav restaurant..
he like the beef keow teow a lot…. I think the best sang har noodles that I had before is the Green Vie restaurant.. Yes, my parents like Greenview too! Waow, the pricing is very steep for this type of setting & location. But still many ppl go there for the sang har mee? My fav sang har mee was at one of the restaurant at SS2, however, the quality has drop so much that it’s not worth a mention now 😛 I remember those days whenever we order the sang har mee, we must “ka dai” (tambah noodle) Hmmm I must go pan heong for a try. Now I’m curious…what’s the restaurant in SS2 called? Prawns that not fresh are yucky! 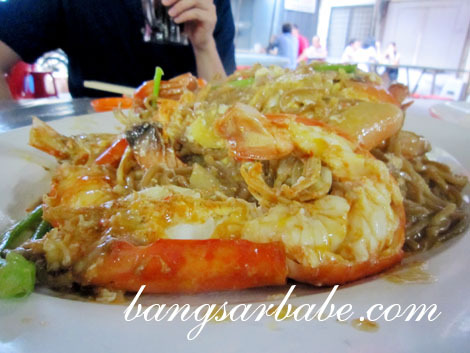 this place sang har meen not nice, u should try sang kee restaurant at jln hang jebat….